Sixteen-year-old Shannon McNamara has exciting plans for the summer, and she can't wait to get to them. Unbeknownst to her, however, her widowed and ailing mother has plans of her own--to relocate them both to the heart of Amish country in Ohio where she has relatives who can look after her. Shannon quickly learns that living a "simple" life is actually a lot of hard work. But when a hot young Amish guy named Ezra enters the picture, she's ready to get an Amish makeover and even consider making it a permanent change. But does Ezra share her attraction? Will Shannon really make the jump into this new way of life? And will it be for the right reasons? Teen favorite Melody Carlson brings fans another sweet story of worlds--and families--colliding, exploring themes important to teen girls through an engaging tale. This one took me a bit before I really started to enjoy it. 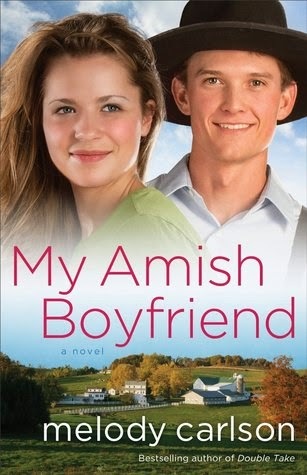 While I love Amish fiction, I felt as if Shannon's character was never fully developed properly. Also, since this was a teen book, the writing style met with that level of reader and I think that's part of what threw me off. I haven't been a teen for quite some time (though it's awful to admit that!). All in all, I think it's a book that a lot of teens will enjoy, but adult readers may not enjoy quite as much.